Oh man. The best part about eating out is when you find individuals who are open minded and are willing to pay the same amount of money as you. Sometimes it's just really nice to eat, drink, and talk with wild abandon. Well, everything in moderation...including moderation. ;) I especially think you have to take this attitude when you go specifically to consume rich, savory, hearty French bistro fare. La Faux Bourgeois was recommended to me by two separate friends in the same day. Essentially it was destiny telling me to check out the delicious cuisine of La Faux Bourgeois. My two friends and I all trooped together to meet at La Faux Bourgeois and throw our middle of the school year anti-stress party. Upon walking in you'll immediately be bombarded with an appetite rousing smell wafting in from the kitchen and steaming off the other patron's plates. La Faux Bourgeois is certainly cozy, with every table perfectly fitting into place and just enough room for the waiters and waitresses to wiggle around to refill waters and deliver food. If you're standing there awkwardly waiting for a table, like us, be forewarned that there is no "waiting area." You'll just be innocuously in the way for a little while. 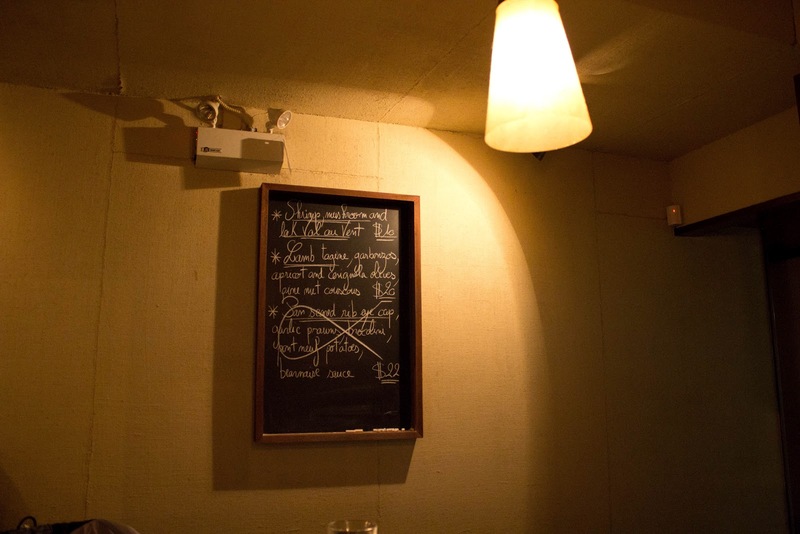 As for the decor, the restaurant is very dim and uses a rich color palette of dark hardwoods, beige, and cream. 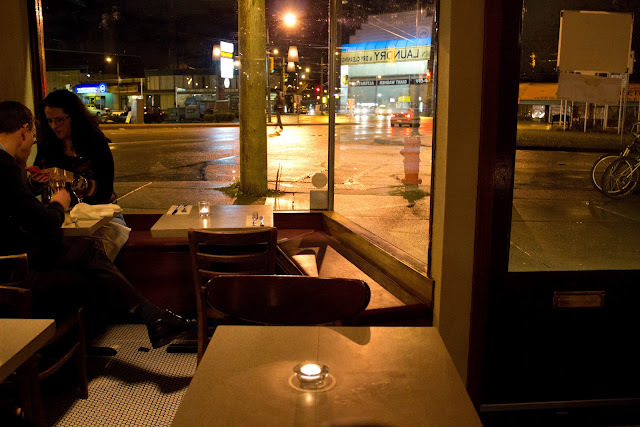 It's very homey and cozy, like a traditional French bistro, and it was the perfect setting to have a nice meal with friend on a rainy, chilly, icky Vancouver night. All the servers are polite, very friendly, and very accommodating. Besides the hostess, I think the entire restaurant was staffed with French chefs and waiters. 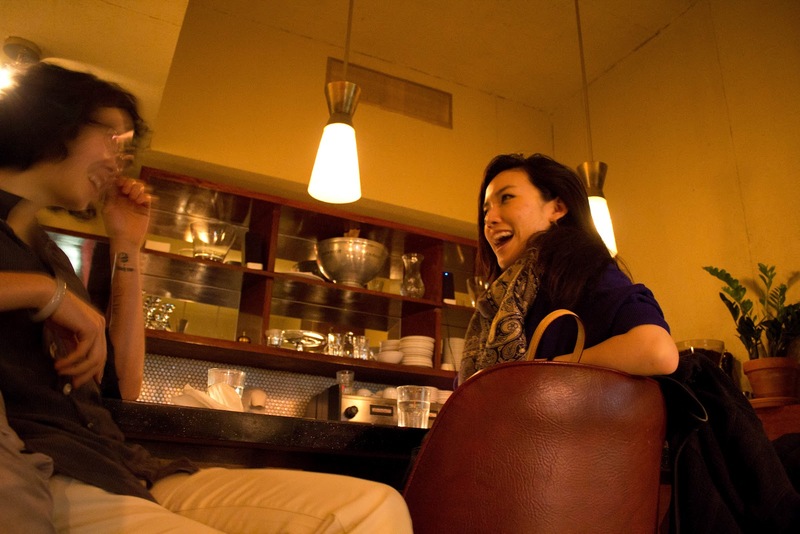 I couldn't make a reservation for the three of us that night, but the hostess promised me that she would get me cafe seating as soon as she was able to. If you come here I highly, highly suggest that you make a reservation in advance. At the time when I called they were already booked two weeks ahead of time. If they don't have room in the main restaurant the hostess will put the spillover into the cafe, which was where my friends and I sat and chatted for most of the evening. Now onto the meal! 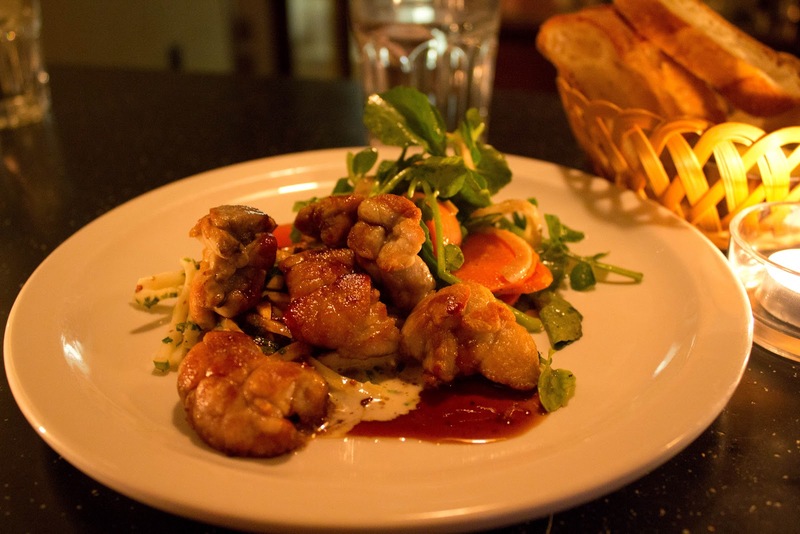 In my entire offal loving life I've actually, surprisingly, never had sweetbreads! I had erroneously thought sweetbreads were the brains of the animal, but the the French waiter that served us was quick to correct me. Actually, dear readers, the sweetbread consists of the thymus or the pancreas of a calf or a lamb. The dish pictures above was a very enjoyable first sweetbread experience. I was half expecting the seared sweetbread to be creamy, but it was more firm in texture and rich compared to the tart, salty cerleriac remoulade and the fresh bite of the watercress. Snails, although a common slimy, garden pest, are delicious. Don't let anyone tell you otherwise. A stereotypical French food, that of course must be ordered with a flick of the hand and a trilling accent, it is incredibly delicious. I suppose some people turn tail or curl their noses at the idea of eating snails, but snail meat isn't at all reminiscent of the living, slimy, creepy, snails and puppy dog tails sort of snail. I think cooking the snail meat in butter, infusing it with the flavors of garlic and parsley, while pairing it with lightly toasted baguette is a wonderful sort of cooking alchemy. Eating snail meat is a bit reminiscent of eating geoduck/mirugai or other solid shellfish meat. 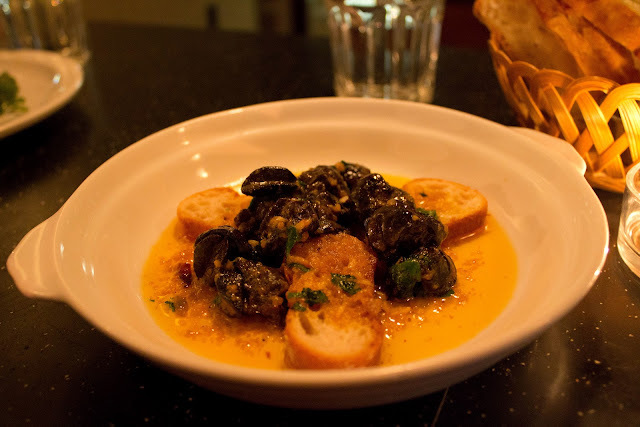 In this particular dish, the escargot is tender and flavorful and paired with the toasted baguette make a delicious appetizer and to wet your palette for the rest of the meal. This is the dish my lovely friend chose to eat. Very graciously she let me have a piece of this wonderful rustic dish. The chicken meat was especially tender and had a very rich is wine-y back palette flavor. Not only were the vegetables nestled under the chicken perfectly stewed and completely saturated with gravy and wine, but the chicken meat was soft, tender and full of flavor as well. 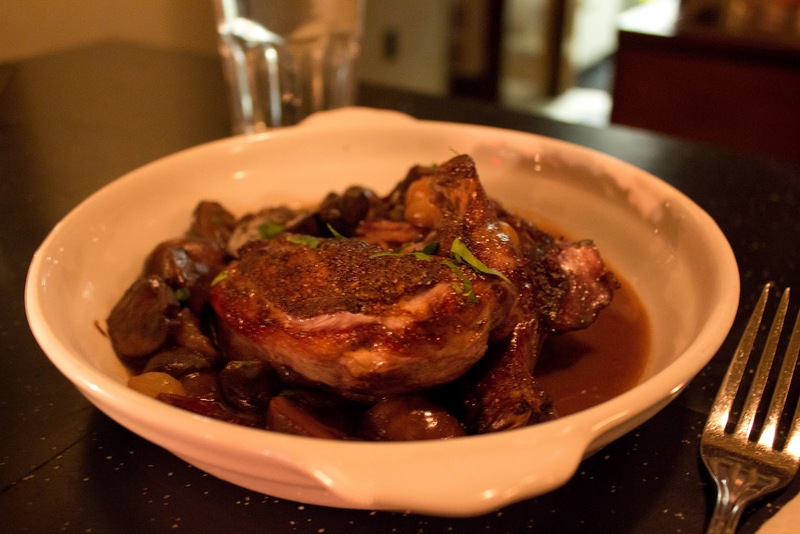 Coq au Vin seems to be a simple dish, but here at La Faux Bourgeois it is incredibly well executed. Its very hearty dinner dish that will leave you feeling full and satisfied, but not bloated. The only gentleman in our little dinner party ordered this dish and I was actually very jealous that he ordered it instead of me. Perhaps simply from the fact that his dish was delivered first and I was still waiting on my Steak Frites! 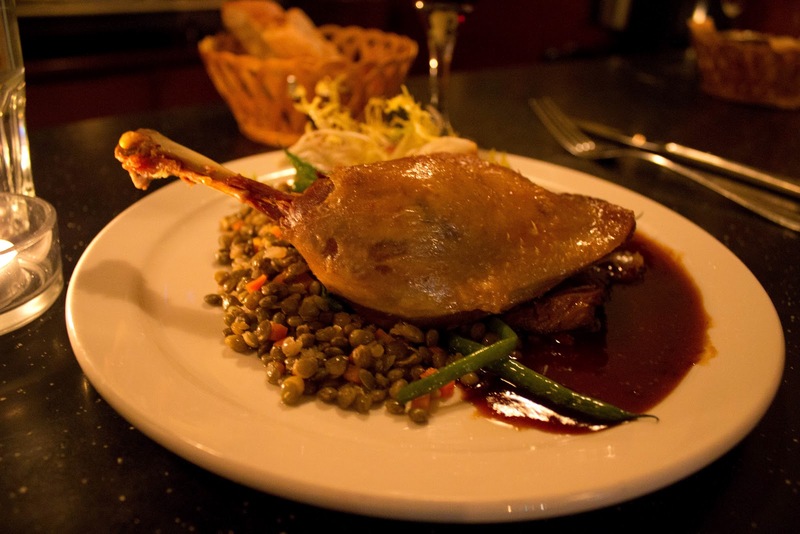 Anyway I digress, Duck Confit is another pretty staple French dish that requires skill and expertise to consistently execute perfectly. I received another bite of this dish, of course from my other gracious friend, and I loved it. The skin was crisp and the duck meat underneath it was tender and smoky. The mustard wasn't very spicy at all, but instead added a complexity in flavor to break up the oil and taste of the duck. 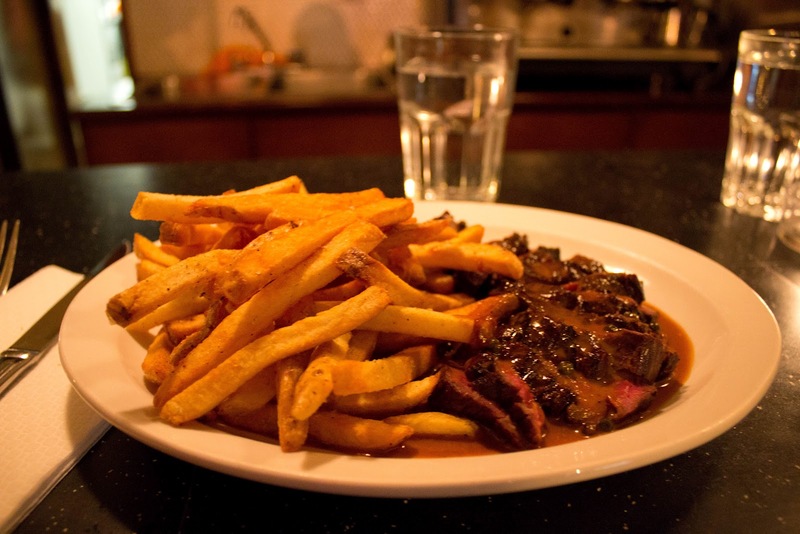 Steak frites...I think it was the first dish I learned how to order in my French class when I was in middle school. That marginal bit of french has served me well, hm? 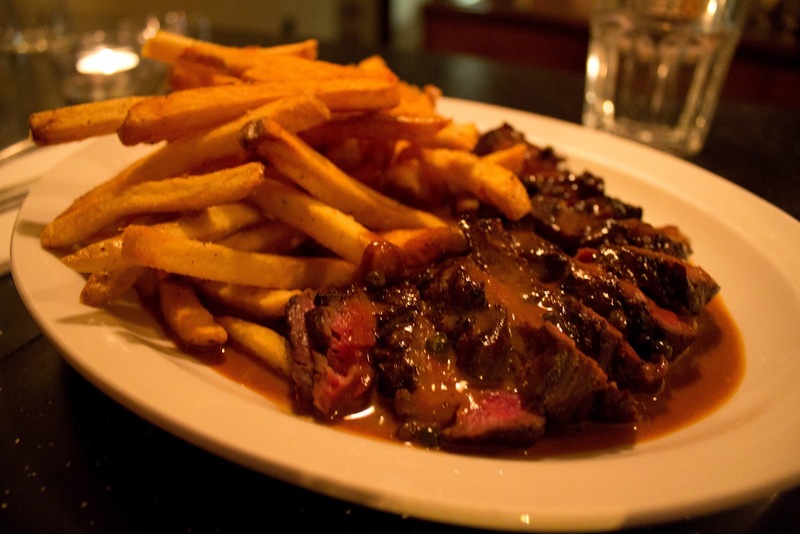 Steak and fries go hand in hand. =) The fries are incredibly delicious, although I'm not terribly sure what they're fried with. I had my suspicions they were either fried in duck fat or lard, but the more I think about it...the more I'm unsure. Either way they were mouthwatering-ly good. I prefer shoestring fries myself and usually I detest thickly cut fries, but these...these!!! Not only were the fries served blisteringly hot right after their bath in oil or fat or unicorn tears or whatever, but the outside was crisp, the inside was fluffy and salted to perfection. The hanger steak is valued for its flavor and is often compared to flank steak in both terms of texture and taste. I could tell the meat was a little chewy, simply from the fact that even displayed on the plate I could see some sinew still holding the meat together. As for the sauce I asked the waiter to surprise me and he told me in a French accent "Medium rare with green Peppercorn Cream it is then." I made a slight change to his order though, I prefer my steak's rare. ;) The meat is flavorful, albeit a little chewy and the sauce adds just a light tang of flavor. Green peppercorns don't have the fire their black, white, red, and pink siblings do, but instead it provides a creamier, tangy, and a bit of a salty tinge to complement the meat. To round off dinner I went all out and ordered a cappuccino. You knw, to aid with digestion after eating all the fine French Bistro fare. I don't claim to be a coffee nut/buff, but I do enjoy a smooth coffee, cappuccino, latte or expresso. 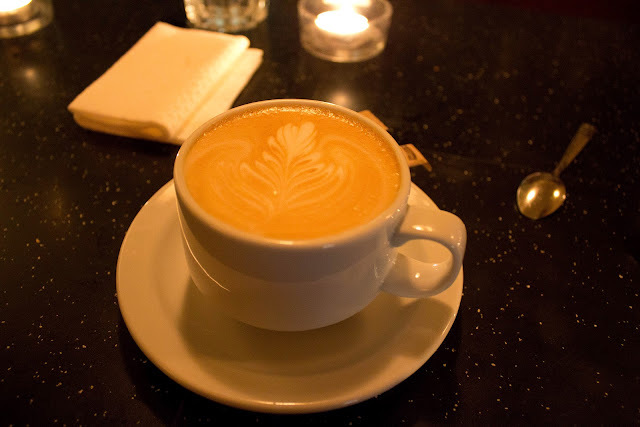 Already this cappuccino was one of the smoothest I've drank and the foam on top was so fine! It was well executed, tasty and I enjoyed drinking it after dinner. 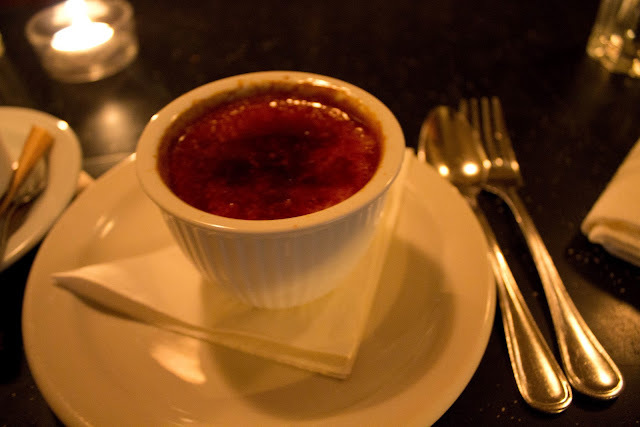 One of the greatest joys in life comes from cracking the top of a crème brûlée, at least that's what Amelie told me. 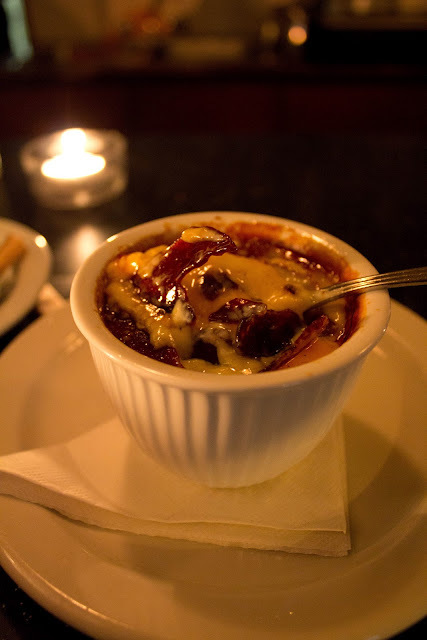 ;) As you can deduce from the name the "classic" crème brûlée is a traditional French dessert dish and a veritable staple at French restaurants and other random restaurants as well. The modest crème brûlée is that well received! However I found that the top of this particular crème brûlée a bit difficult to crack, which is a good thing! The sugar on top was really quite thick and was almost like a thick, glossy veneer rather than caramelized sugar. The burnt sugar and the sweet, thick creamy custard melt together well to complement and offset their respective flavors. The slight bitterness of the burnt top and sweet creamy custard underneath meld together to create a delicious dessert experience. The custard underneath the burnt sugar was so well done and just absolutely littered with vanilla bean seeds! It wasn't too heavy or too light, but just right. Goldilocks style. I swear sometimes when I was scooping up the cream and shoveling it into my mouth, the custard almost appeared slightly grey because of all the vanilla beans that had been stirred in. Very delicious and a french classic. Again I was generously offered a bite of this beautiful cake by my equally beautiful lady friend and was again blown away. Unfortunately, I'm not a dark chocolate person and this cake was so, so, incredibly rich. It screamed dark chocolate nutty goodness. At this point I was so full that I was glad I hadn't chosen this particular dessert to guzzle down. 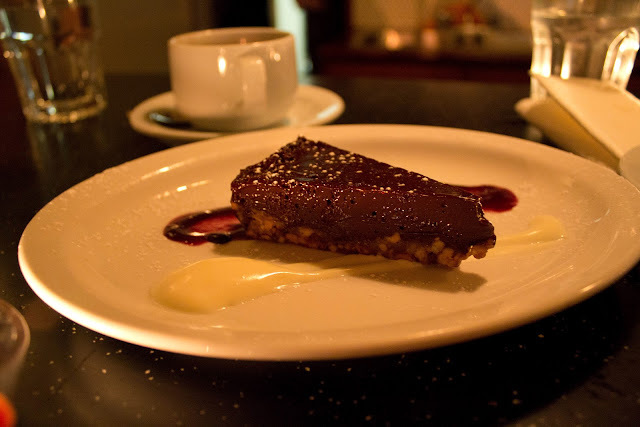 It's a very rich, silky, creamy dark chocolate, nut encrusted cake that sticks in your mouth, throat, and palette before it makes it down to the stomach. If you love rich desserts and dark chocolate I highly recommend this to you. 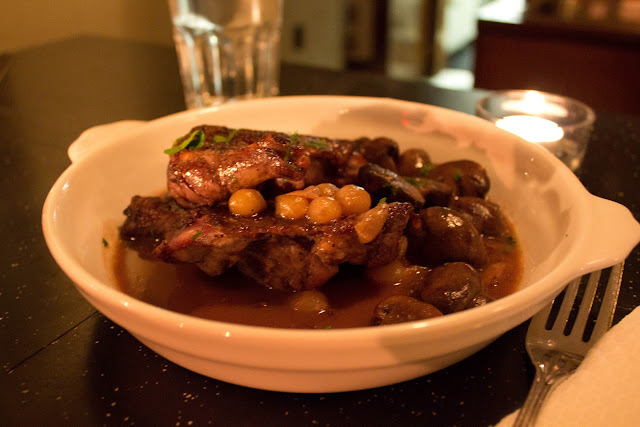 All in all, I give this little French bistro the highest accolades for the dishes, atmosphere and service. I must reiterate that I highly recommend that you make a reservation if you want to eat at this place, I tried initially and they told me they had reservations booked two weeks ahead. Not only that, but the overall cost of the place for a student's wallet is phenomenal. The prices can be found at their the Le Faux Bourgeois website: here, but the Steak Frites were only $18 dollars! For a perfectly executed meal I was astonished by the price at the end. My friend and I probably paid about $40 dollars each for a lovely wonderful meal. 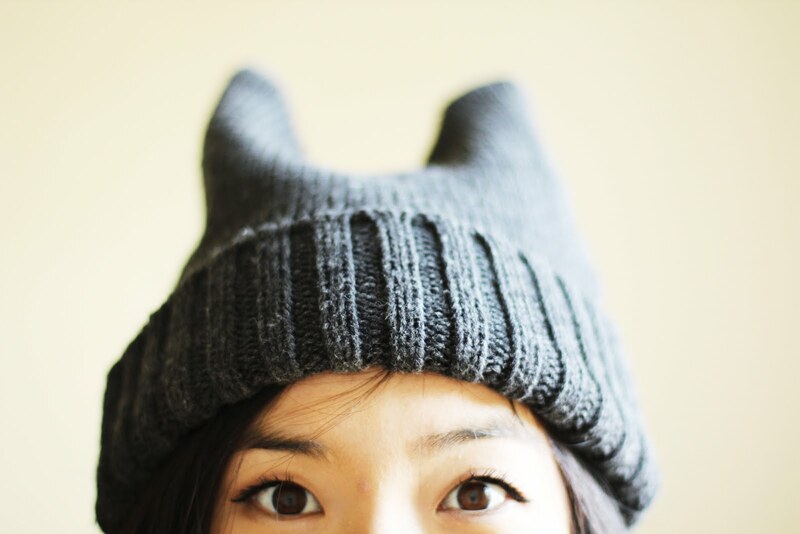 I highly, strongly, passionately recommend that you go. Kid Friendly: No, I only say this because of the space and the lack of children already at the restaurant.